SKINZ Mitten Scissor Clamp - Camo - Trout - USA Flag - FlyBass.com | Bronzeback Enterprises, L.L.C. 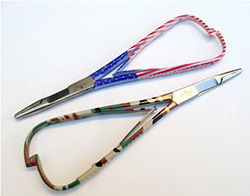 Choose between the USA Flag, Camo and Trout mitten scissor clamp. This 5 1/2" instrument is designed with a serrated scissor and both a smooth and grooved combo tip to quickly and safely remove hooks, press down barbs and attach split shot. The mitten clamp was originally designed for winter fishing, where gloves or mitten are common in the cold weather. Now the versatile instrument is becoming popular in all types of weather. There are no finger holes to get in the way and the sensitive spring action opens comfortably when released. Simply squeeze the mitten clamp to engage the ratchets and squeeze again to disengage and open the clamp. Our line of mitten clamps feature straight jaws, are comfortable to use and come in a variety of colors. This is a well thought out and well made tool for my vest or table. It does everything it's advertised to do and feels good in the hand. I had been looking for something like this for the last few months. This came up on my radar and “bingo”! Thanks for the great work. In my opinion NuCast makes the best mitten clamps. I purchased the Trout Skinz and the finish on these are excellent. These are part of my EDC when I'm on the water. I received order status updates and shipping was fast.